"The graph, like the photograph, has an air of authority, authenticity to it. The audience interprets these as factual documents first, without questioning them." Amaris Ketcham teaches interdisciplinary courses at the University of New Mexico. Her creative work has appeared in Creative Nonfiction, the Los Angeles Review, Rattle, and the Utne Reader, and is forthcoming in the Kenyon Review. 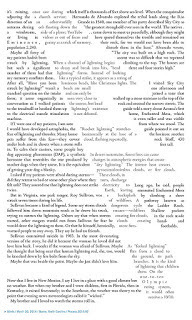 We featured a preview of Ketcham's essay "Recorded Lightning," from Creative Nonfiction, back in February. SM: “Recorded Lighting” is a piece you’ve defined as a concrete essay. 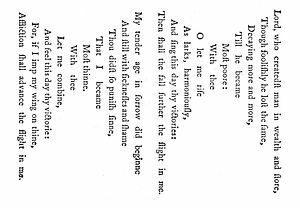 What do you think this old poetic form has to offer a modern reader? AK: I used the term “concrete essay” to describe that piece because instead of combining text and image—the way, say, Claudia Rankine does, or Bianca Stone—the text becomes the image. It’s something that I probably first saw in poetry, then hand-lettered design. When I was a teenager, I got my first position as an editorial assistant at a literary magazine. I remember trying to typeset someone’s concrete poem that was in the shape of a Venus figurine. We’d gotten a hard copy and I had to mark up the page, measuring the distances, and then try to get the tabs in QuarkXPress to cooperate. The whole time I was very nervous about messing up this person’s art. I think that in a way, text is the most abstract form of art. Say you have an apple, then a very realistic drawing of that specific apple, then a more simplified drawing of an apple, then maybe a one-color logo of an apple, then the printed word “apple”—each time you are taking a step down a representational line, from the object itself to ideas of the object. There is no real “appleness” to the written word “apple,” which itself is an abstraction of the spoken word “apple.” You don’t know what other people see when they read a word—but if you were looking at an image of an apple, then you are both seeing that apple. So when you create a concrete poem or essay, you are taking a step backward down the representational line, combining the totally abstract text with the simplified image of an object. SM: Your article “Wintering Habits of the White American Male, Age 34,” follows the structure of an academic essay. 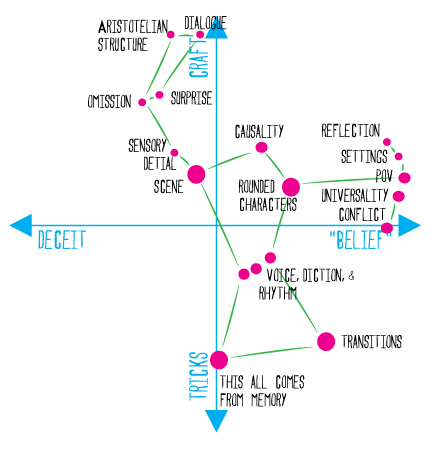 “How to Determine Truth” interrogates three diagrams you’ve made to measure and represent your memoir in terms of its “factuality.” Do you consider these “hermit crab” structures? Are there differences in the way a concrete essay engages an audience vs the way a hermit crab essay might? Or do you think their modes are more similar than different? Which essay form is maybe most like a pie chart? A scatter plot? A magazine spread? AK: I think that you could call “Wintering Habits of the White American Male, Age 34” a hermit crab structure, because it is a fictional text that appropriates the style of an academic article. It’s odd to call that piece a short story because there isn’t any narrative to it, or any real reliance on chronology the way that a story values time, cause and effect, or plot above all else. So it’s a fictional essay, which was something I was thinking about after reading some collections of Jorge Borges’s fictional work. I wonder if you would call his fictional essays hermit crab stories because they make a home out of the essay structure? 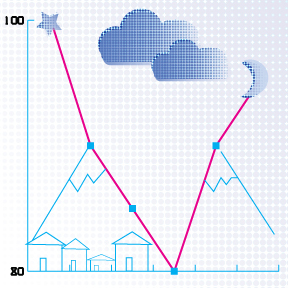 You can tell all kinds of stories with graphs—and they don’t have to be true stories, either. The graph, like the photograph, has an air of authority, authenticity to it. The audience interprets these as factual documents first, without questioning them. I think that people question “creative nonfiction” more than they question a photograph or a scatterplot—probably particularly because that pesky adjective “creative” can lead people astray. 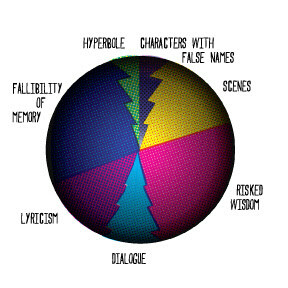 In “How to Determine Truth,” I was playing with the idea of a graph as a storytelling image that a person constructs and can manipulate to tell whatever story they want. 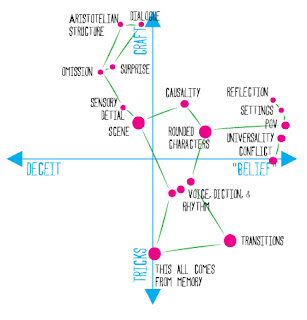 Ketcham's scatterplot from "How to Determine Truth"
SM: This is something I’ve wondered too—How much of what a hermit crab essay borrows has to do with design and how much has to do with genre? The first element signals and enables the second, as you describe, in the way a footnote functions in an academic article as compared to in a lyric piece. I must admit I’m a little tired of the term “hermit crab” which defines such a limited relationship text might have with a form. But I like that the gesture of an essay could be a kind of home re: crabs—a structure that gives shape—especially because the essay is a thing interested in subjectivity instead of universal truths. Kerry Howley seems to be playing with just this idea in Thrown, by writing an immersion narrative using the perspective of her fictional persona. Do you think the essay really is more like a form or a gesture than a fact-based genre like “nonfiction”? Are there other folks you see working in this space between genre and form? AK: I’m not sure what the history of the term “hermit crab essay” is. Did it come from Judith Kitchen? One of the aspects of the term that I do like is the “readymade” implication of the finding and repurposing a “shell” or a form. It has the potential to give an ordinary object a new meaning. How much of Marcel Duchamp’s “Fountain” (a urinal purchased at a hardware store and placed on a pedestal) is there, in say, “The Heart” by Jean-Claude Silbermann (which reads as though it is instructions for preparing a heart and can be found in a book of surrealist games). I don’t think the term has to do with genre so much as the epistolary act of borrowing a form, whether that form is a letter, a chat window, a newspaper clipping, a set of instructions, or any other kind of document. And while we talk about “essay” as a noun, or a genre, or a type of creative nonfiction writing, it’s important to remember its roots as a French verb. An essay is a process as much as anything. That act of exploration. The attempt to derive meaning or insight from life. I’m not sure that the content or the form is as important to the essay as the method. "The medium performs a constant balancing act between valuing information enduring through time or valuing information traveling through space." SM: How do the various contemporary mediums available for reading—from the smartphone to the book—influence the ways you design and write? AK: I think that the medium does influence the way that I—or anyone for that matter—design or write because the medium changes the way information travels. The medium performs a constant balancing act between valuing information enduring through time or valuing information traveling through space. For instance, we have petroglyphs lining a basalt escarpment across the river from where I live. The people of the Middle Rio Grande carved these petroglyphs about 700 years ago. Early Spanish settlers added crosses and other images about 400-500 years ago. Now new Rio Grande people and their suburban homes surround the area. These messages have endured for centuries and they will likely last for several more centuries. But, the petroglyphs don’t travel through space. If you want to see this art, these messages, you have to travel to them. But the internet has an additional layer of ephemerality. Is a digital medium ever truly fixed? Each time you open a jpeg on your computer, you corrupt the file a little more. Information on a web page does not even outlast its leased domain name—edits are continual; hackers are perpetual. Wikipedia may go belly-up: online, our national histories may not exist tomorrow. Even though it seems more stable, print doesn’t last forever either. You might have something printed in a literary magazine and you read through your contributor copy then put it on the shelf. The book-artifact will begin its slow decomposition on the shelf, its organic compounds will begin to break down, and it will smell of vanillin. The glue will weaken and the signatures will fall out, the edges of the pages will crumble to the touch… Some relative may find it in a few decades, open to your page and inhale. Ketcham's chart from "How to Determine Truth"
SM: It seems that a lot of environmental art is built to demonstrate that process of decay and ephemerality. But the artists I know who do this expose objects to the elements much more often than they do texts. This may be because texts and their usual materials deteriorate rapidly outdoors, but I’ll say it’s also somehow more difficult for me, as a viewer, to witness a text deteriorating than to watch an object decay. Clare Dolan of the Museum of Everyday Life, who I interviewed this summer, once curated an anti-preservation exhibit that seemed to poke at this inclination to preserve texts. Her show also functioned like a protest when curated inside a Book and Paper Arts program. Borrowed forms often also feel like a kind of small revolt that uses constraints to further an essaying gesture. 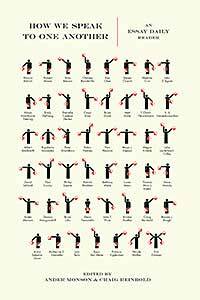 I sense this gesture in many examples of your work too. Have you ever made a text that you intended to endure, or expected to decay rather than to travel? Do you think there an inherent contrarianism behind concrete and hermit texts? AK: I’ve seen some work, too, that plays with that kind of decay—or perhaps “mutation” would be a better word—of work in the “wilds” of the internet. One that I remember asked the question, what happens to a wiki of Crime and Punishmentwhen you invite people to rewrite Dostoyevsky? Of course, the text changed drastically. My personal website has been hacked a few times, so that might add to sense that pieces composed or published online are so subject to digital decay. It seems like anytime you compose or create for work for a digital system it can suffer from what might be environmental decay (hackers, loss of quality due to compression, etc.) or technological limitations—the limitation of newer technology to have a reverse compatibility with the older model, where the newer system doesn’t have the ability to decrypt or decode the original (consider: making art that ran on floppy disks, composing an essay on Google maps, etc.). I had a moment of inspiration a la John Cage the other day when I was working on a drawing, scanned it, opened it in Photoshop, and some kind of glitch took over. Each time I clicked on anything in the program, the glitch ran again, and an entirely new distortion of my image would appear. I took a few screenshots of my favorite results, but I think that to exhibit it, the glitch would have to be active so audience could participate with the performance. "It will be interesting to see whether (and how) editing as art takes off in the “post-truth” era." SM: You’ve published stories, essays, and poems. Do you think that the possible relationships between design and text shift within the constraints of different literary genres? AK: The expectations and constraints of the different genres can create different ways to experiment with the design of a work. A footnote (which is an object of text layout design) means something different in nonfiction than it might in fiction or poetry. Lately I have been thinking that there is a design aesthetic that we are starting to see with the editing process—there’s John D’Agata’s beautifully designed book, The Lifespan of a Fact. The artist James Bridle compiled all the edits to the Wikipedia page on the Iraq war into a 12-volume set. There is even something beautiful about looking at Gordon Lish’s edits to Raymond Carver’s work and reading what has been removed. It will be interesting to see whether (and how) editing as art takes off in the “post-truth” era. Ketcham's pie chart from "How to Determine Truth"
SM: You’ve studied anthropology, writing and design and now teach in an interdisciplinary program in New Mexico. Do you prompt your students to compose texts that use other media? Do you have tips for educators who are interested in teaching writing that engages with other disciplines? AK: In a number of my classes, I require students to present a photo essay to the class before they begin working on their creative nonfiction essays. It forces them to organize their thoughts, creating an outline of what they will say before they sit down to write, and it forces them to think visually: “What does an establishing shot look like for this essay? Why would I choose to frame a close-up on this person/object?” It allows them the opportunity to hear what kinds of questions the audience has about their work based on this initial glimpse. I would recommend team teaching with someone in a discipline housed on the opposite side of campus. This year I co-taught a class on reading and writing the landscape with a paleontologist. It was wild to listen to him talk about how to make observations of the landscape, and think—wow, that’s basically the same thing I do, but in different terms, and of course, with completely different outcomes. Sarah Minor curates the Visual Essay series here at Essay Daily, previously featuring folks like Kristen Radtke, Marian Bantjes, and Bianca Stone.